Thad has a vast knowledge of the roofing industry’s products and installations procedures… he is a wizard when it comes to customer service. 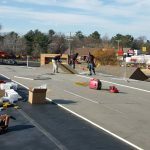 Sales Rep / Hometown Roofing Inc. 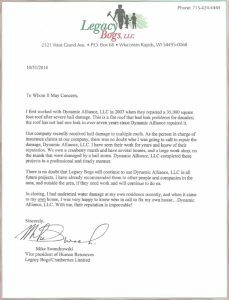 I have known Dynamic Alliance for several years now professionally… through my relationship with this company I have come to understand their extensive knowledge and commitment to quality they bring to their work, so they were my choice for the work at my house. My wife and I could not be happier with the results. They discovered areas that were at fault with the previous work done and corrected them. They completed the work professionally and on schedule. Our company recently received hail damage to multiple roofs. As the person in charge of insurance claims at our company, there was no doubt who I was going to call to repair the damage, Dynamic Alliance. I have seen their work for years and know of their reputation. Dynamic Alliance repaired all hail damage in a professional and timely manner. There is no doubt that Legacy Bogs will continue to use Dynamic Alliance in all future projects… With me, their reputation is impeccable! Dynamic Alliance installed a new roof on our Auto Repair shop building. The building has had multiple additions and has been modified many times for previous businesses. 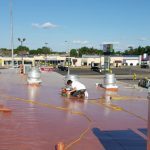 The roof Thad & his crew installed has eliminated many leaks where the additions have been added & the insulation below the roofing membrane has made for a much more comfortable work environment in the winter months. Thad and his crew were very efficient. They did not disrupt business while they were working & left the site clean when finished. Thanks for a great job. 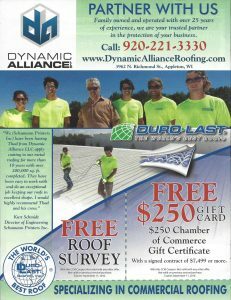 Thad Brown of Dynamic Alliance LLC is an industry leader in technical Roofing knowledge. If your looking for a good man to do a good job you need to look no further.